I don’t know about you, but I’m nosy. I love the “whats in my make up bag” posts that have been going around, but I’m not really a make up bag sort of girl. (I do have a giant make up box that cost a painful Ã‚Â£45 from Sallys a few years ago (but it keeps everything neat, organised and together) but I never take anything out with me besides a lipgloss) Instead, I thought I’d do a good old “what sort of shite do I carry around on a daily basis” post. This is my current handbag, one of the Mulberry for Target bags that Alex gave me for Christmas. Have I told you about that? Probably not. I know that originally I said I wasn’t fussed by the Mulberry for Target collaboration. And I wasn’t! 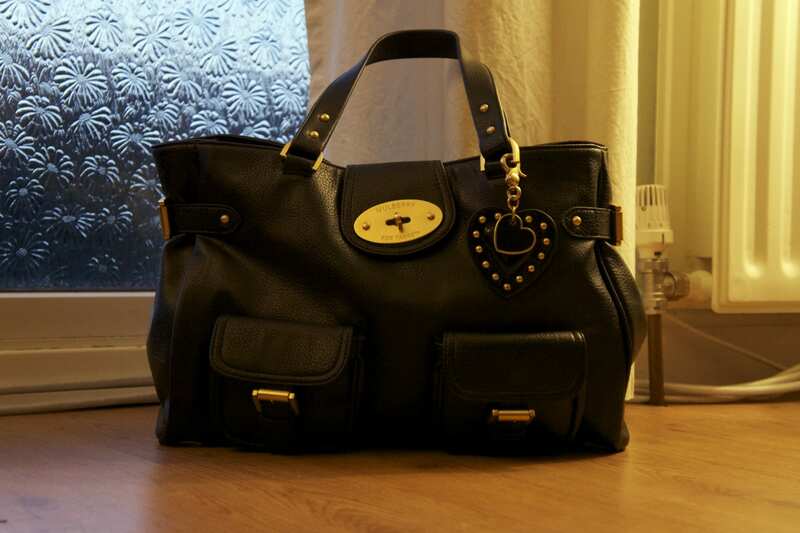 This was a good thing, as there wasn’t much hope of me getting one – it was easier for me to get a full price Mulberry bag! Except then the boy disappeared to Las Vegas and Houston for a week. As a joke, I forwarded him an article about the Mulberry for Target collection and asked if he’d pop in. However, my initial reaction is still the same. The bags didn’t look like much on the promo images. Before Christmas, I was using the larger Bayswater style denim bag which I wouldn’t have chosen myself. There is also the fact that despite Mulberry being a very British brand (based in the glorious West Country), they have chosen to partner with an American brand to produce handbags made in China. Unfortunately quality has suffered as a result. After using the bag for about 2 weeks, I could already see signs of use – scuffing from the handles on the patent flap, part of the handle peeling, stitching not quite right, clasp feeling like it’s going to fall off – these are not things I would want to link to Mulberry! Anyway. Rant over. If anyone would like to get me a Mulberry bag, I’m still in love with this one. So this is what the bag currently holds (well, at the time of taking the photo, which was last Wednesday. I know, I’m lazy.) Sometimes, I wonder why my bag is so heavy, when its barely got anything in it. This is why at I usually carry around with me. Wonder no more. Next to the iPhone are my pretty blog mini Moo cards in their case, and below is the usual hand cream and Carmex tubes collection (Why do I need two?!) The lipgloss is from Bare Essentuals and takes like cake. Yum. Bus tickets, mirrors, mints, gift cards, change and my new Costco card were all lurking at the bottom of my bag. The brown thing under the iPad is my purse that I actually won via Twitter. Woo! Finally, my graduation black heels and my umbrella, which don’t need any explanation really. Who knew I could say so much about the stuff in my bag?! Ok you are very neat and tidy! My bag looks like something vomited chaos in to it. And I thought my bag was heavy! I am so nosy and love to see what everyone else is carrying around. Love your bag! 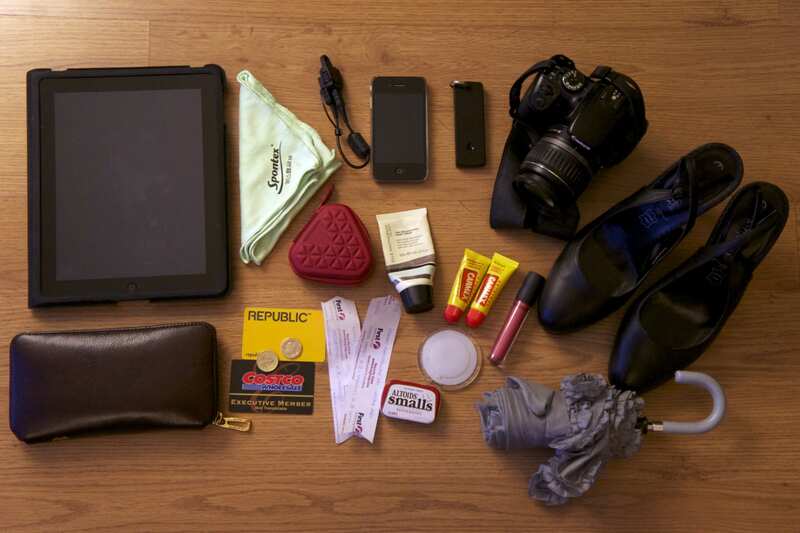 I really should take a photo of my work bag….the contents of which are actually remarkable. (this is not my lovely mulberry/target bag as although beautiful and i loves it. It is not quite big enough to fit the kitchen sink I clearly appear to carry in my work bag). That is one full handbag! I am majorly impressed you carry so much around with you, but then I know if I had a bigger bag I’d fill it up too! My bag is so full of rubbish, it’s unreal! Whatever size bag I have, I fill it up to the top so I try not to buy big bags anymore or my arm will fall off!